In this joint statement with RFSL, delivered on behalf of a coalition of 20 LGBTQI human rights defenders from all regions who were present at this Council Session, we highlighted how essential it is that LGBTQI people have equal access to development, and that we are recognised as equal stakeholders, and can actively participate in society. With this statement, ILGA drew the Human Rights Council's attention to cases of violence and discrimination against LGBTI persons that have occurred in the past few months: "We cannot remain complacent before the scope and severity of the ongoing violence and discrimination that lesbian, gay, bisexual, trans, queer people are facing." With this joint statement endorsed by several organizations from around the world that work on indigenous and LGBTIQ issues, we highlighted how the negative impact of colonization on the ancestral sexualities, gender identities, expressions, and spiritualities of Indigenous peoples has had devastating consequences, including loss of acceptance of people of diverse identities within their own societies. With this statement, we highlighted how stigmatisation and discrimination on the basis of gender and SOGIE increase during times of turmoil, often leaving LGBT people to experience a level of violence and exclusion beyond that borne by others. With this statement, we shared with the Human Rights Council a few examples of countries where we have recently seen progressive measures taken to protect LGBTI persons, in the hope that these best practices can help build other countries' capacities. 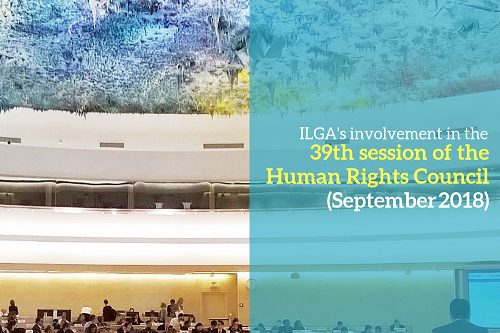 During the 39th session of the Human Rights Council, ILGA will work with human rights defenders from various countries to help deliver statements during the UPR adoptions. During the 30th UPR Working Group Sessions, Cameroon received 12 SOGIESC recommendations. During the 30th UPR Working Group Sessions, Colombia received 3 SOGIESC recommendations, and accepted all of them. During the 30th UPR Working Group Sessions, Germany received 8 SOGIESC recommendations. During the 30th UPR Working Group Sessions, Uzbekistan received 12 SOGIESC recommendations. It accepted one of them, and noted the remaining 11.